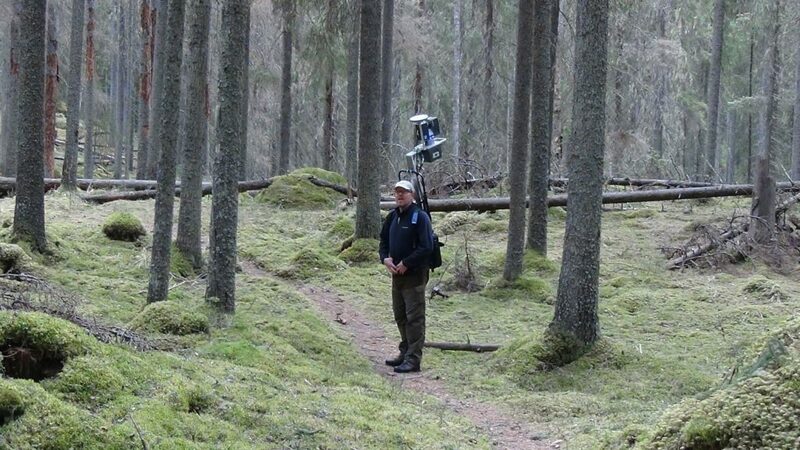 The potential of terrestrial laser scanning (TLS) in forest applications, both in industry and in national forest inventories (NFIs), has gained increasing awareness in the last two decades. Boosting this development, there has been tremendous research efforts and progress on the topic. In 2014, a TLS benchmarking project was launched by the European Spatial Data Research Organization (EuroSDR) and hosted by the Finnish Geospatial Research Institute (FGI). 18 groups from Asia, Europe and North America have successfully processed the data and submitted their results for evaluation. Latest results of the work were published in ISPRS Journal of Photogrammetry and Remote Sensing along with open data on the sample plots. Three complexity categories of the sample plots in the TLS benchmarking: “Easy” (left) represents sparser stem densities and little understory vegetation, “Medium” (middle) represents moderate stem densities and sparse understory vegetation, and “Difficult” (right) represents high stem densities with dense understory vegetation. © Centre of Excellence in Laser Scanning Research, Xinlian Liang. 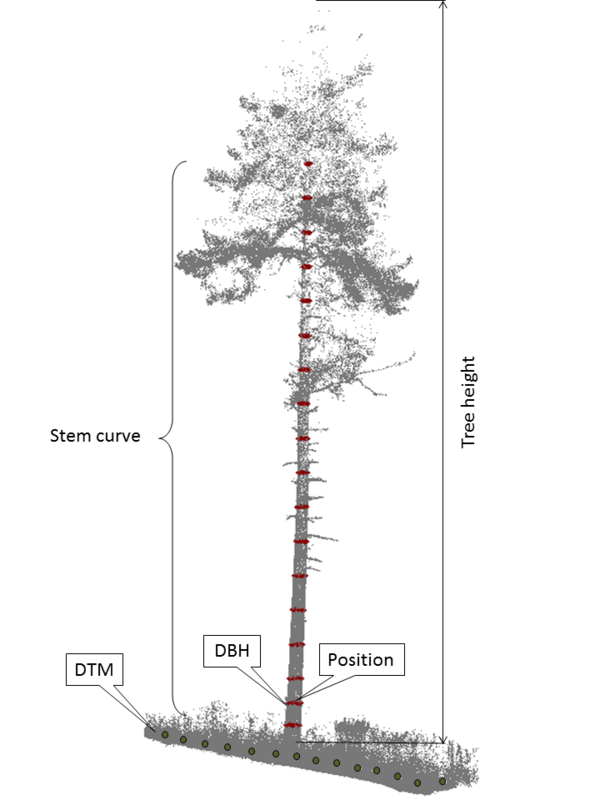 Terrestrial laser scanning is an effective technique for measuring forest plots. A terrestrial laser scanner automatically documents its surrounding environment in three-dimensional (3D) space with millions to billions of 3D points. The technology is anticipated to be practically used in forest in-situ observations, e.g. national forest inventories. According to the benchmarking results, TLS is great at extracting forest attributes of trees that are recorded in the point cloud data. These attributes, i.e. diameter at breast height and stem curve estimates, can be measured at 1-2 cm accuracy level which is close to what is required in practical applications, e.g. national forest inventories. Remaining barriers are mainly from the occlusion effects that prevail and hard to eliminate in forests; therefore, attributes of trees such as tree heights are difficult to estimate. Five criteria extracted from TLS data at the plot- and tree-level. © Centre of Excellence in Laser Scannning Research, Xinlian Liang. The single- and multi-TLS data, as well as the reference data, of six sample plots of this benchmarking project can be downloaded from here. The data is opened to anyone who is interested in TLS based forest investigation for non-commercial use. Since the reference information is also opened, users can evaluate their own feature extraction approaches and results by themselves, and compare their own results with the other results reported in the project publication. When making a publication based on the open data set, please reference the date source of the ISPRS journal paper International benchmarking of terrestrial laser scanning approaches for forest inventories (Liang et al 2018). The results of this international benchmarking suggest that TLS as well as sophisticated automated algorithms are ready to be used in practice under easy forest conditions, e.g., forests with good visibility or single trees. The operational use of TLS in forest mensuration is a complex process. The current bottleneck is the lack of practical software and it requires time to develop such software. The emerging mobile and personal laser scanning (MLS/PLS) have the potential to solve the occlusion problems of TLS, but have yet to achieve similar accuracy . 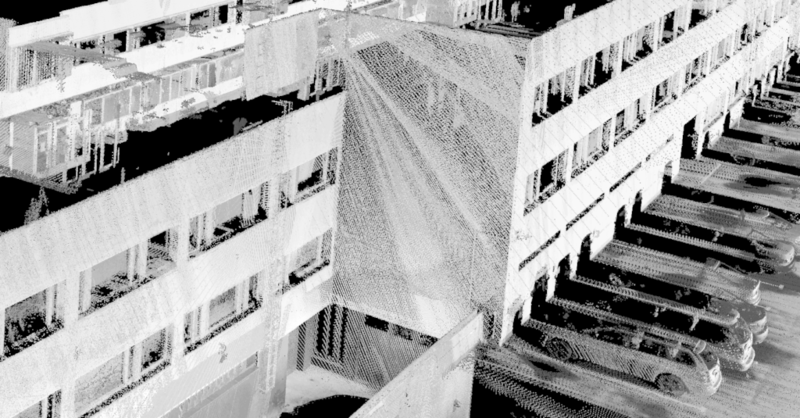 It is worth noting that TLS currently provides the best quality terrestrial point clouds in comparison with all other technologies, meaning that all the benchmarks labeled in the benchmarking results can also serve as a reference for other terrestrial point clouds sources. Our novel Hyperspectral Terrestrial Laser Scanning (TLS) dataset has been published as open data. The laser scanning point cloud dataset consists of 30 individual scans collected as a time series covering a 26 hour time frame. 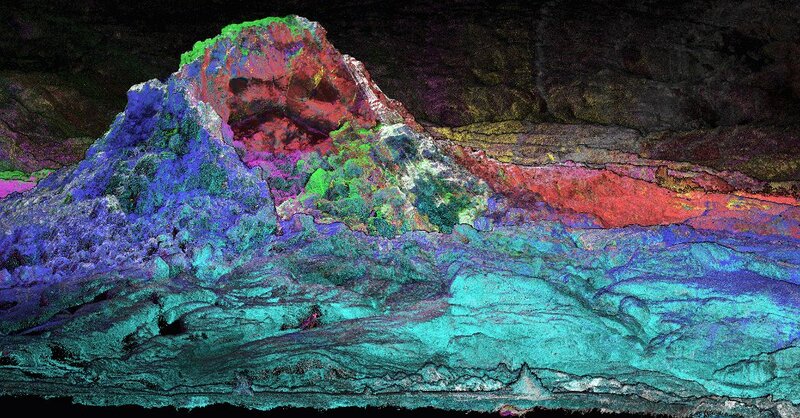 Each point in the laser scanning point cloud contains colour information from several different wavelengths. Ordinary laser scanning data has colour information from one wavelength. 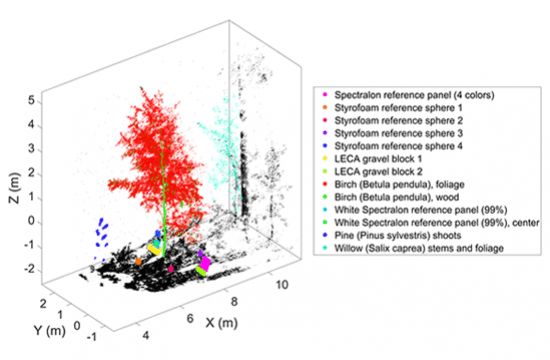 Compared to traditional laser scanning data, hyperspectral data has advantages in for example target recognition and change detection, where it is possible to track changes of color of tree leaves, as in the data published. Also 3D RGB presentations can be produced from data without using separate camera. All laser scanners enable collecting data without external light source, also in the dark. The dataset is available via the Etsin research data finding service provided by the Finnish Ministry of Education and Culture (http://urn.fi/urn:nbn:fi:csc-ida-4x201604052015015324658s). Datasets are provided in .laz format and published under the Creative Commons Attribution 4.0 International License (CC-BY-40). Movement of a birch during the night. Personal laser scanners (PLS) lead the way towards compact, agile and flexible solutions for mapping complex environments and challenging locations, such as rugged terrain and complicated urban structures. Our Akhka R2 backpack laser scanning system allows the operator to move in and around the scene while capturing the environment with millimetre precision. 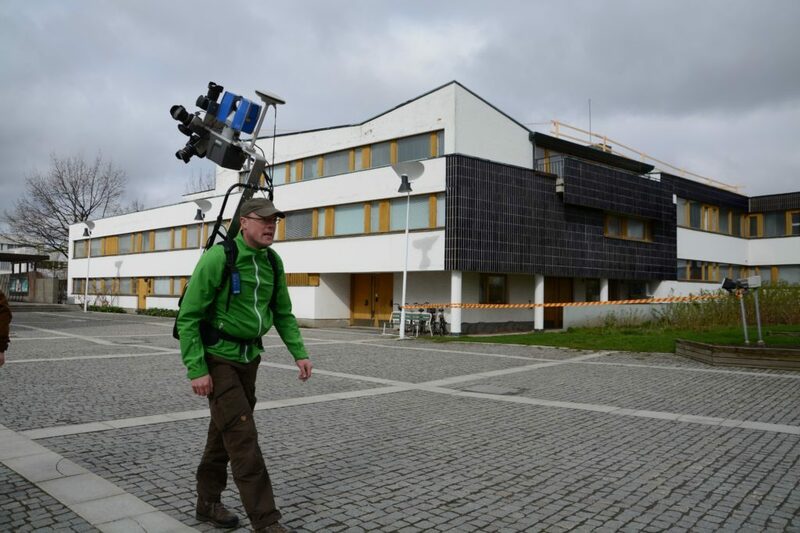 Read more about the latest development in the GIM International article Laser Scanner in a Backpack – The Evolution towards All-terrain Personal Laser Scanners. A publication by Dr. Harri Kaartinen and his team is the top cited paper in the Remote Sensing journal in years 2012-2014. The article An International Comparison of Individual Tree Detection and Extraction Using Airborne Laser Scanning is based on the work the project “Tree Extraction” coordinated by CoE-LaSR researchers and organized by EuroSDR (European Spatial data Research) and ISPRS (International Society of Photogrammetry and Remote Sensing). The purpose of the project was to evaluate the quality, accuracy, and feasibility of automatic tree extraction methods, mainly based on laser scanner data. Memorandum of Understanding signed between Finnish Geodetic Institute / Centre of Excellence and Shinshu University. Read more. Juha Hyyppä now has over 5000 Google Scholar citations. Further information in his GS profile.